PRICE REDUCTION!! This single story pool home is move-in ready. 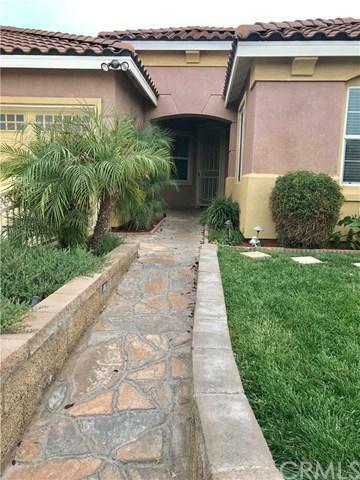 Located in West Hemet, this home sits on a corner lot and offers 4 bedrooms plus an office/den, 3 full bathrooms, formal living room, formal dining room, a family room and a very spacious kitchen with upgraded cabinets, granite countertops, and pantry. The master bathroom has been remodeled with upgraded tile, double shower heads, separate tub, and vanity with double sinks. All flooring was upgraded with a combination of wood floor, carpet and tile. 3 car garage with an extended driveway for additional parking, gated courtyard and low maintenance landscaping to save on those water bills. The backyard is great for entertaining featuring a heated pool and spa, two covered patios, a bar height serving area with built-in mini fridge and can easily be extended to add a built in bbq. As if that wasn+GGt enough, this home also comes with solar panels. Walking distance to elementary, middle, and high school.